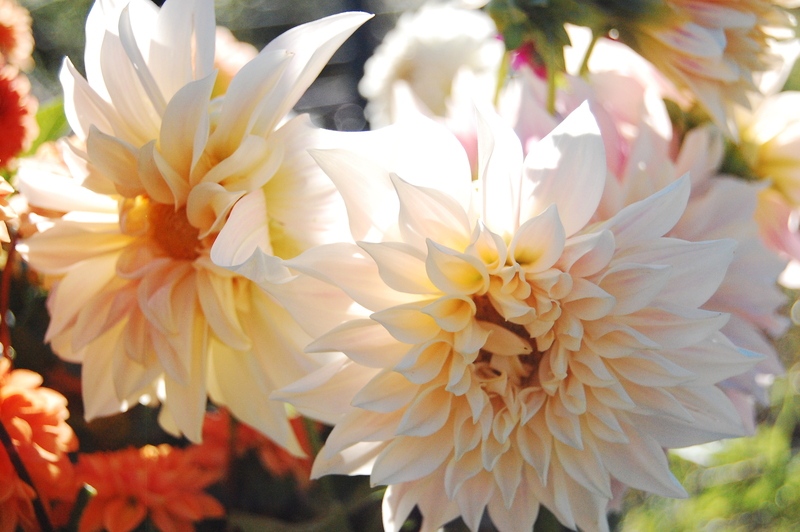 After transitioning onto our land in Hurdle Mills last year, this year we are focused on really improving how we grow flowers. How? Better handling, better cultivation, and happier farmers. Building our hoop house last winter really helped us meet our goal of improved germination. This spring we are focusing on three new projects: irrigation, landscape fabric mulch, and refrigeration. Early spring flowers with irrigation. Irrigation: This isn’t something we can easily capture in a photo, but having drip irrigation has made a huge difference. Last year, we grew flowers relying only on the rain. This year, with some assistance from George at L’il Farm, we are using drip irrigation. Although it is still only spring, we have already noticed a difference. Our plants are growing taller and faster, which makes sense. If plants, like us, are mostly water and they don’t have enough water, they will be small and not as healthy. 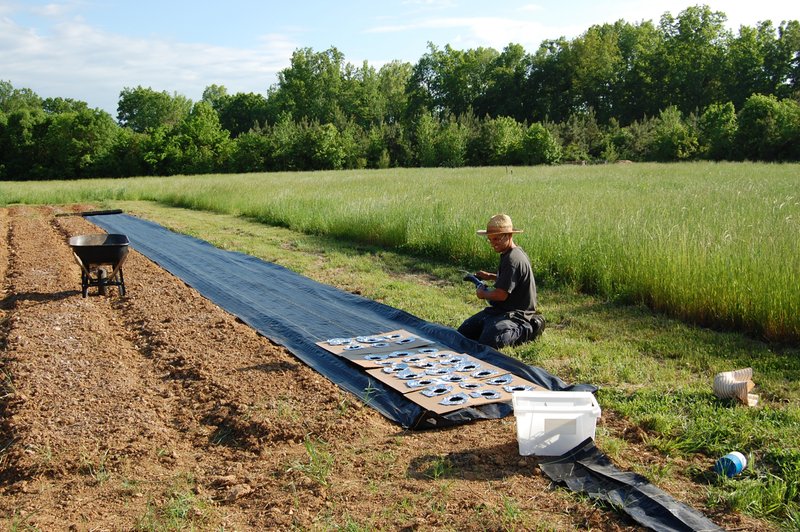 Landscape Fabric: We have a huge problem with yellow nutsedge on our farm. This perennial weed grows back faster than we could possibly pull it out, and we were feeling discouraged and desperate. We needed a solution that would allow us to spend less time weeding and more time growing and selling flowers and building our house. 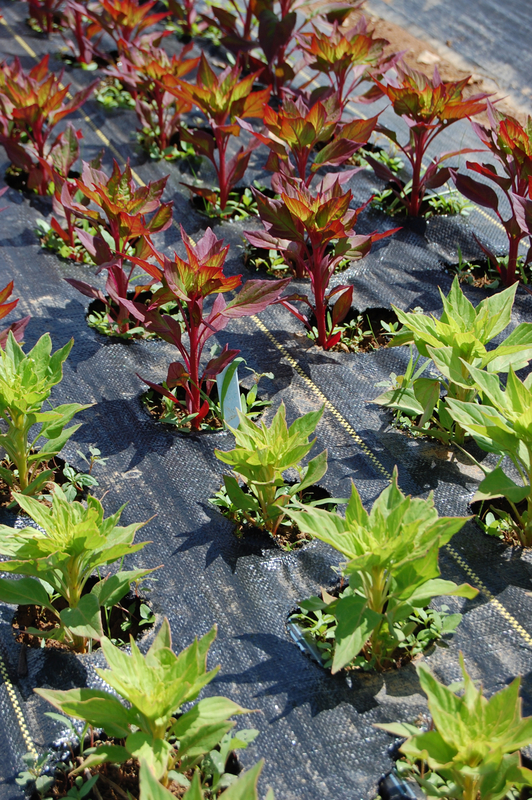 Zinnias, Celosia, Tomatoes, and many other plants growing in landscape fabric. We decided to use woven landscape fabric as a mulch. Using a form that we made, we used a propane torch to burn holes in this durable material. We transplant into the holes, which we still have to weed once or twice, but the transplants quickly shade out the small opening in the mulch. 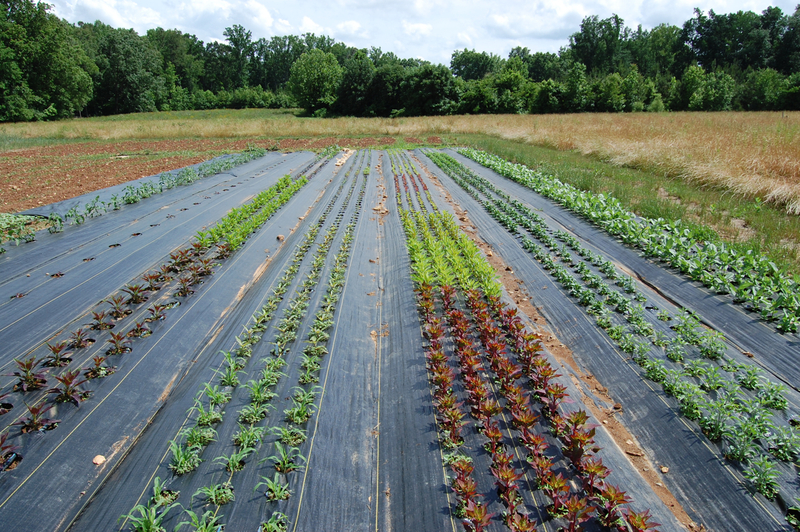 And unlike traditional agricultural plastic, landscape fabric can be reused for many years. The landscape fabric also warms the soil in the bed, and combined with our irrigation, we have found this benefit to greatly increase the speed our plants are growing. We will definitely be using landscape fabric as much as possible in the future. Using a torch and cardboard form to burn fabric. We have stopped using the foil. And landscape fabric has increase our efficiency in another way, too: We found we weren’t planting at the density we thought we were. By standardizing our bed width and planting at the proper density, we have really increased the number of plants we can fit in each bed, meaning we need fewer beds for the same number of plants and greatly improving our efficiency. “Chief” Celosia growing in landscape fabric. Refrigeration: We have been told time and again that nothing will improve the quality of our flowers or our farm profitability as much as having a cooler. Having a cooler allows farmers to pick flowers at the perfect stage and store them for a couple of days until they can be sold, as opposed to picking them just before sale even if it isn’t the ideal stage of harvest. This reduces waste and improves quality. 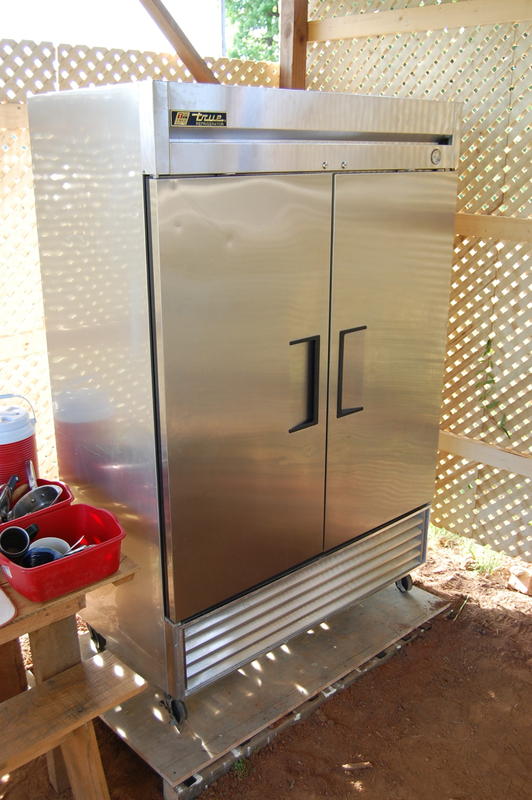 With inspiration from our friends Lee and Dustin Pollard, who are opening a food truck and catering business called Lost Boys, we decided to buy a used commercial reach-in refrigerator. We found this fridge on Craigslist. It was in our budget and was a lot easier for us to deal with right now than such a big project as a walk-in. It will hold everything we need it to for the foreseeable future. After that, we expect we’ll be able to build the walk-in cooler that we will need, but while we’re building our house, it is simply too big of a project for us to take on. Our new two-door reach-in commercial fridge. We are so excited about everything we have going on here at Spring Forth Farm. 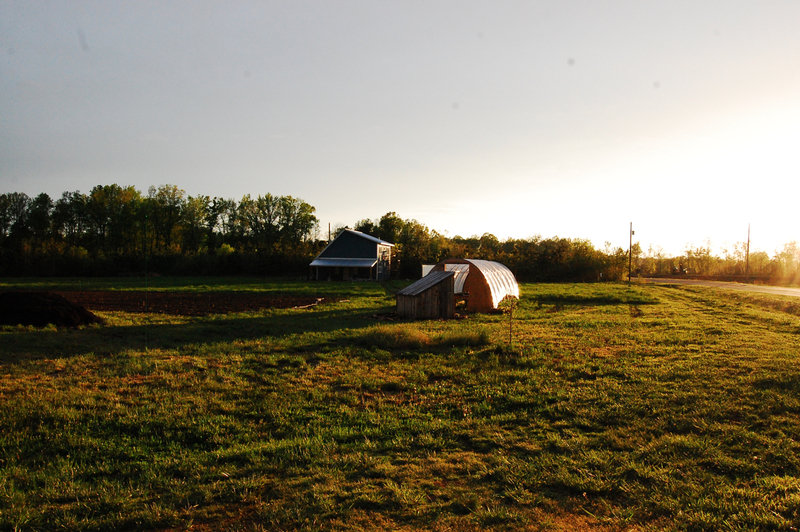 Adding irrigation, landscape fabric, and a fridge will allow us to spend more time on other farm projects such as planting, harvesting, and soil improvement. With more flowers and more time, we can also increase our sales. We are excited to share that our flowers are now at Haven Salon in Hillsborough. And we are slowly starting to work on one other project: Woody Perennials. Buddleia. It is amazing how fast this plant is growing. This Viburnum macrocephalum (Chinese snowball) will grow to be ten feet tall. 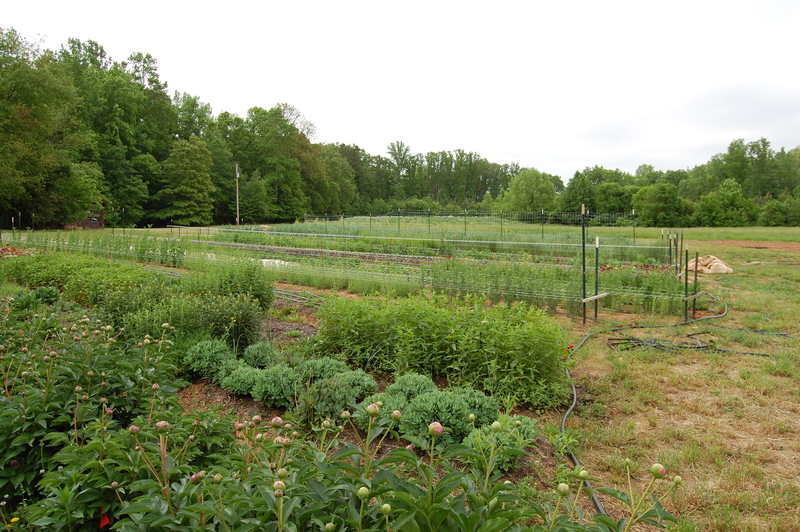 We know that offering a wide variety of perennials is one way we can set ourselves apart from other local farms. Adding these plants is a long-term project, but this year we were able to start with two, Chinese Snowball Viburnum (Viburnum macrocephalum) and four colors of Butterfly Bush (Buddleia davidii). Since we have such wide open spaces on the farm, we also hope that these woody shrubs will act as windbreaks, helping reduce the force of the wind on our flowers. It has been a busy and eventful spring on the farm and we are excited about where all of these new projects can lead. Very nice post! I love the details as the season unfolds!